Really? Wow! Inever seen the film...but had read about it in PSYCHOTRONIC mag many moons ago! Far out! If that picture literally describes the title... then it has to be CHEERLEADERS BEACH PARTY (1978). Not quite....the release date for this one is 1977. It ain't "Satan's Cheerleaders", is it? That beach looks like the one they used for damn near EVERY Crown International beach movie. Aye...it's SATAN"S CHEERLEADERS! Yer up! Possibly "The Bandit Of Sherwood Forest"? Kester, bless you, brother. You are right. Also known as "Sword Of Lancelot". A definite hoot to watch. Where else will you see Cornel Wilde split heads and bodies asunder? Plus, a batch of wimpy looking barbarians! 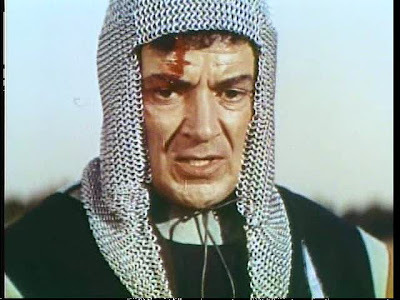 Marvel as Cornel Wilde shames the French with his silly accent. And Jean Wallace is heavenly as a young queen (at 43). This should be easy for some, harder for others. "Cockeyed Cowboys of Calico County"?